A “geo-fence” is a virtual perimeter for a real-world geographic area—a virtually fenced off geographic location. Geo-fences can take any shape. They can also be user-generated thanks to custom-digitized geo-fencing options. Combine geo-fencing with a dynamic alerts feature and you’ve got yourself the next evolution of live mapping technologies for crisis mapping. Indeed, the ability to customize automated geo-fenced alerts is going to revolutionize the way we use crisis maps. Several live mapping technologies like Ushahidi already have a very basic geo-fenced alerts feature. Lets say I am interested in the town of Dhuusamareeb in Somalia. I can point my cursor to that location, specify the radius of interest around this point and then subscribe to receive email and/or SMS updates for any new reports that get mapped within this area. If I’m particularly interested in food security, then I can instead subscribe to receive alerts only when reports tagged with the category “food security” is mapped within this area. This allows end users to define for themselves the type of granular information they need—a demand-based solution as opposed to a supply-side (spam-side?) solution. But this feature is old news. There’s only so much use one can get from a simple subscribe-to-alerts feature. 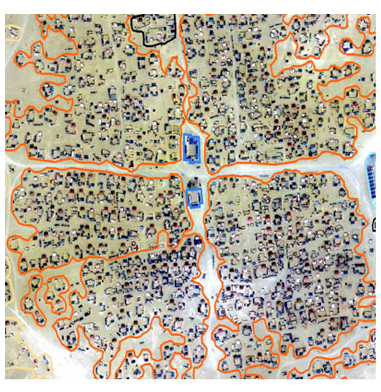 We need to bring more spatial and temporal geo-fencing solutions to crisis mapping. For example, I should be able to geo-fence different parts of a refugee camp and customize the automated alerts feature such that a 10% increase over a 24-hour period in the number of reports tagged with certain categories and geo-located within specified geo-fences sends an email and/or SMS to the appropriate teams in charge. The variables that ought to be customizable by the user include the individual geo-fences, the time period over which a percentage change threshold is specified (eg., 1 hour, 4 hours, 24 hours, 2 days, 1 week etc. ), the actual percentage change (eg., 5%, 20%, 80% etc) and the type of categories (eg., food security, health access, etc). In addition to percentages, users should be able to specify basic report counts, e.g., notify me when at least 20 reports have been mapped within this section of the refugee camp. These actions could include emails, SMS, twitter alerts, etc., to specific individuals with pre-determined content based on the parameters of a check-in. Actions could also be “physical” actions, not just information communication. For example, a certain type of customized geo-fenced alert, depending on where/when it happens, could execute a program that turns on a water pump, changes the temperature of a fridge storing vaccines, etc. We need to make live mapping technologies more relevant for real-time decision support and I believe that geo-fencing is an important step to that affect. p.s. Naturally, GIGO (garbage-in, garbage-out) still applies. That is, if the data is of poor quality or not existant, adding automated geo-fencing alerts is not going to improve decision-making. But that’s the case for any data processing feature. 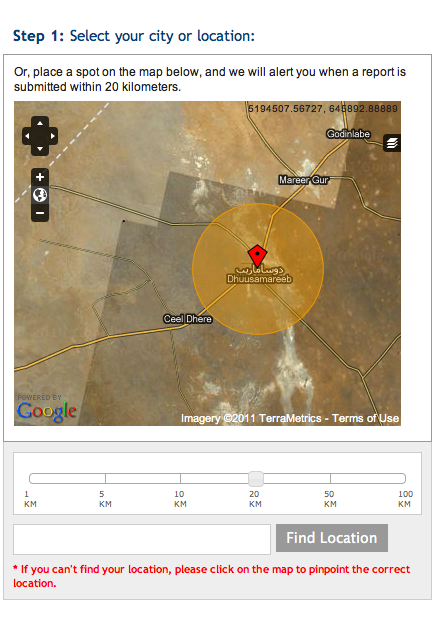 So my colleague Brian Herbert and I are in the process of adding geo-fenced alerts features to the Ushahidi platform. This entry was posted in Crisis Mapping, Early Warning, Humanitarian Technologies and tagged geofence, geofencing. Bookmark the permalink. I just did a course on Emergency Alert (EA) and OSOM emergency messaging systems being used by Country Fire Authority Incident Control Centre in VIC, AU. The EA system can send voice messages and sms which are sent to a mapped area. You can specify which part of the area gets the message first. See http://www.emergencyalert.gov.au/index.php?option=com_directory&task=item&cid=7. Very interesting idea to geofence/categorise return type messages. May thanks for sharing, Brian, the EA system looks very interesting. Yeah, adding polygons to the map would be an amazing Ushahidi feature. Actually, in Crowdmap in the message editing panel – Ushahidi moderators can draw polygons. The capabilities discussed in your article are definitely ones that are highly valuable and useful. CommandCore (an integrated common operating picture) provides robust mapping functions similar to the ones you have outlined. Admins of the system can establish geofences to track perimeter movement and search specific areas. In addition, automatic notifications can be disseminated when these geofences are triggered. An integrated system, CommandCore will also incorporate other devices (such as alarms or sensors) that when triggered, will also automatically enable notifications and workflows. Geofencing is very usefull when you need to distribute the region monitorized by your team, mainly if you will give specific responsabilities to different people on different areas. Is a step forward on increasing the impact of these tools giving the “Wow!” moment by offering diferent users the services adapted to their specific needs.